In today’s post we’re going to learn about The Dermot O’Hara series of detective books set in the beautiful southwest of Ireland. The Belfast born author writes under the pen name Michael McDonnell and today tells us how a vacation in Ireland inspired a whole series of books. And so I hand you over to the author …. 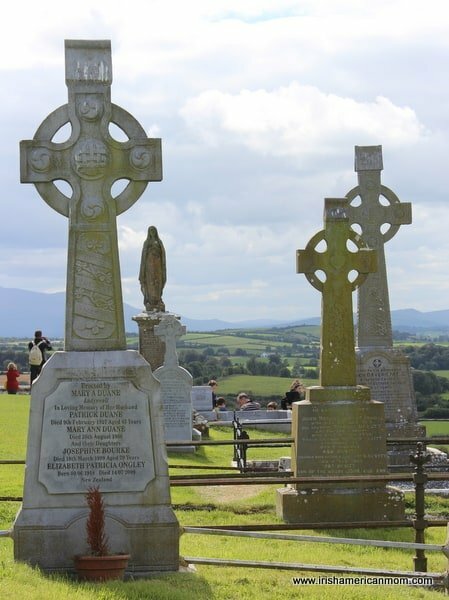 How Ireland Inspired My Writing …..
One question writers get asked a lot and for which there is rarely a precise answer, is…. I’m fortunate in that I can pin down the exact time and place when the idea emerged for a series with a laid back Irish detective at its heart. 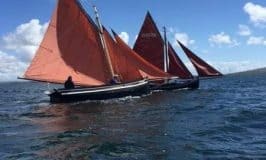 We were staying at a B & B (bed and breakfast) close to the town of Kenmare on the stunningly beautiful coast of Kerry, when the central character made his first appearance. The real version was a genial Garda officer who, with his wife, ran the guesthouse as a sideline. 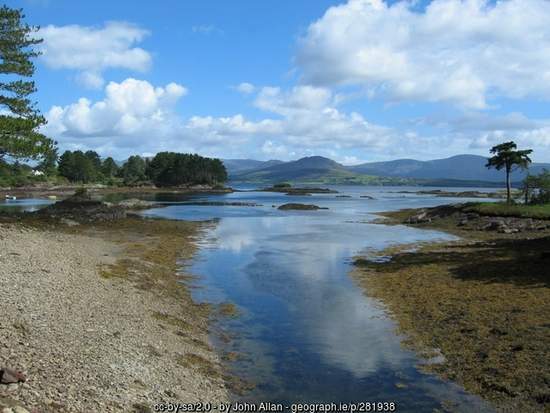 As we talked to him, it became clear that fishing was this policeman’s real passion and upholding the law something he squeezed into his busy angling schedule (I hasten to add that Kenmare is a peaceable place and our host was not neglecting his duties)! A few days later, at Renvyle on the west coast, the weather had closed in. Gales lashed rain against the windows of our hotel as we watched from the comfort of two armchairs either side of a roaring fire. My wife and I talked about Kenmare and I imagined what might happen if our easy going Garda officer was confronted by real and serious crime. A few pages of scrawled notes later and the first Dermot O’Hara novella, ‘Thicker Than Water’, was born. 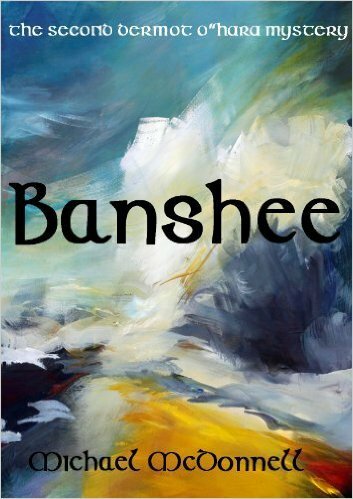 One year after that a full length sequel, ‘Banshee’ arrived with a broader range of characters and a more complex plot. The third Dermot O’Hara Mystery, again a full length novel, will be available in Spring 2016. I publish the novels on Amazon under the pen name, ‘Michael McDonnell’. 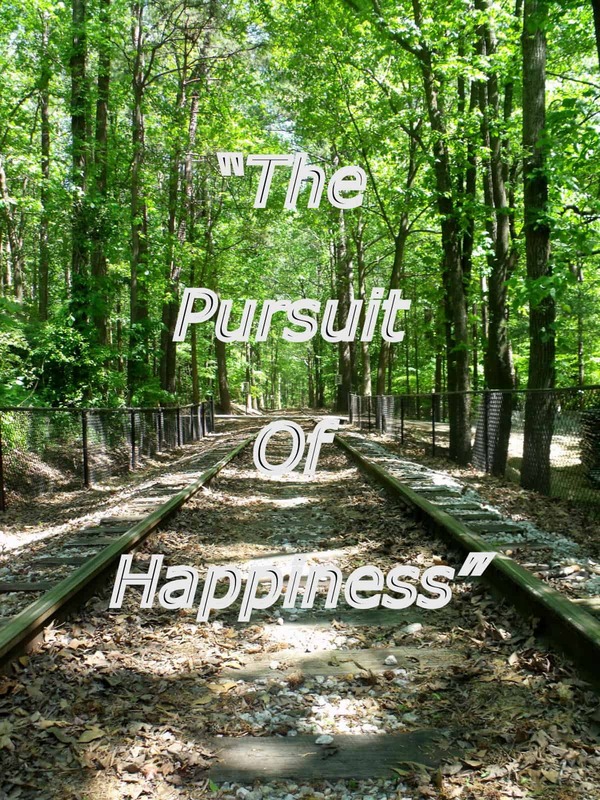 It has been a rewarding experience with readers responding positively to my writing. I think the review that pleased me most was the one that read …. 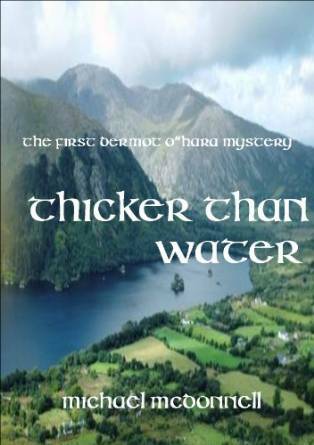 The first book in the series is called Thicker Than Water. The second book in the series is Banshee. Here’s a little introductory blurb …. A big thank you to the author for sharing his books and writing inspiration with us today. Wishing him every success with the third book in the series, which is due to be published soon in spring 2016. 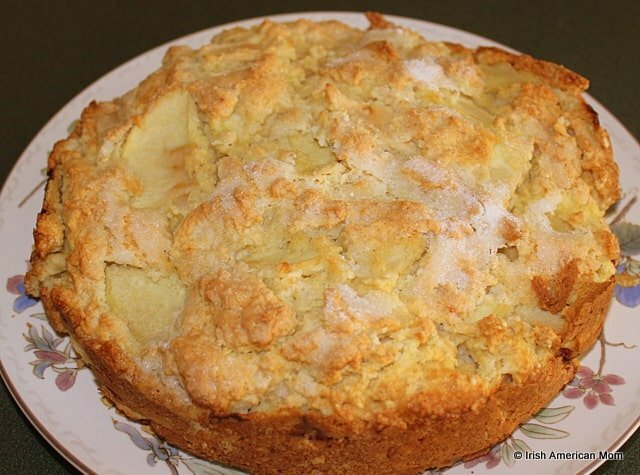 Kerry Apple Cake, also known as Irish Apple Cake, is a moist cake with a crunchy top, and can be served cold or warm with chilled cream or custard. An Irish Apple Cake is technically not a cake at all. Apple bread is a better description, but I suppose our ancestors assigned the title cake to any baked good with a little bit of precious sugar added. Known as Kerry Apple Cake in many parts of Ireland, I thought it was high time to share my recipe, especially since we took a lovely photo tour of County Kerry in an earlier blog post this week. This cake was traditionally cooked in a bastible, a black wrought iron cooking pot. The bread was covered in the pot and hung over the fire to cook. 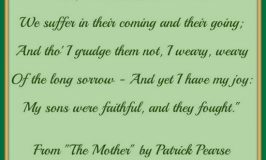 I remember my granny’s kitchen in County Cork, with a black iron kettle singing over the fire, or the bastible cooking potatoes or bread. The day the open fire was replaced with a big range, complete with oven and cooktop, has left an indelible mark on my memory. On that day I witnessed the end of an era. But that’s a story for another day. The apples I use are Granny Smiths. If I was in Ireland I would use Bramley cooking apples, the best apples in the world for baking. But alack and alas I can’t find my favorite cooking apple here in America. But why are they better than an eating apple, you may ask? When cooked they retain a lovely tangy flavor, and with heat develop a pefect ‘melt-in-the-mouth’ texture, since they contain more acid and less sugar than other apples. Granny Smiths are my chosen substitute when baking this cake in America, because they are the tangiest of American apples I can find. You’ll notice I stuck one small apple into my ingredient shot, just to prove every apple is not created equally. They come in all the same shapes, but different sizes. 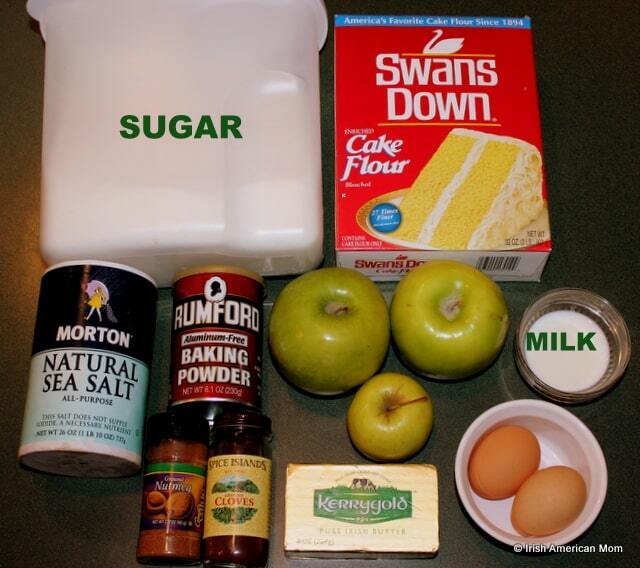 The amount of sliced apples used is key to apple cake success so really check your apple size. Three apples means three large Granny Smiths. If you can only get small apples, then you will need to use at least six. Preheat the oven to 375 degrees. Prepare a 9-inch round baking pan by spraying with oil or coating with butter. 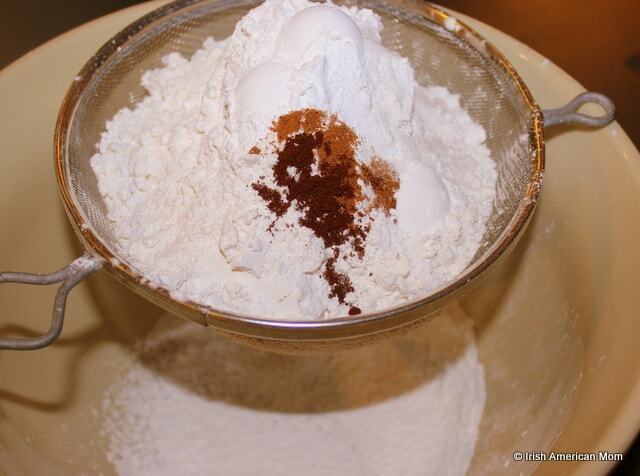 Sift the cake flour, baking powder, salt, cloves and nutmeg into a large mixing bowl. 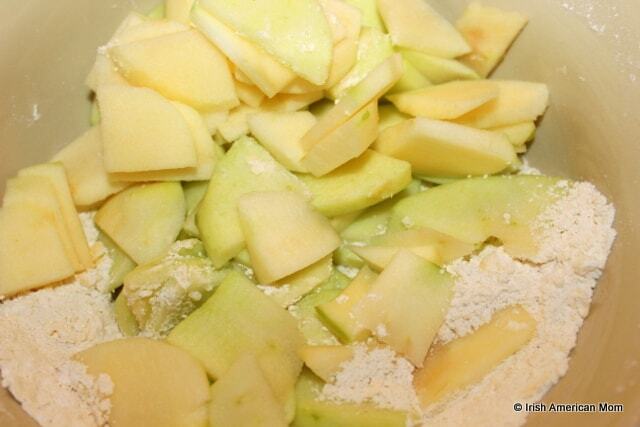 Trust me – you need a big bowl, because once the sliced apples are added you’ll have a large amount of cake mix. I like to prepare the flour and rub in the butter before I peel and slice my apples. This avoids adding browning apple slices to the cake. All-purpose flour works for this recipe, but I prefer cake flour. 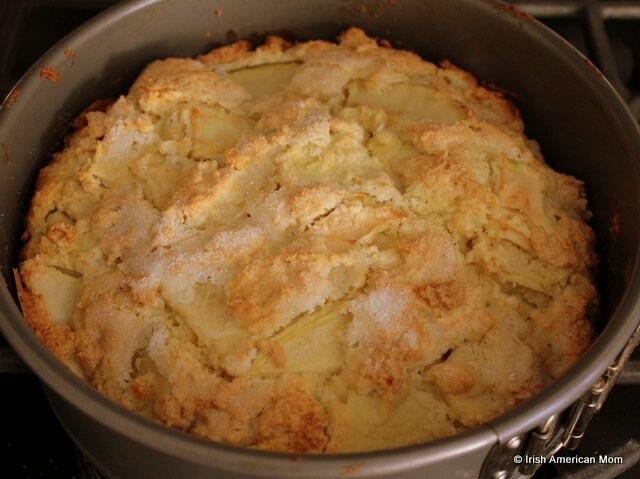 This lighter flour produces a softer crusted cake, which better resembles an apple cake made in Ireland. You’ll notice I don’t use any cinnamon. 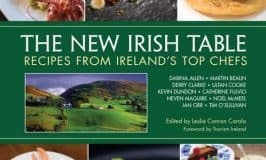 I prefer to add a hint of cloves and nutmeg, spices more closely associated with apples in Ireland. If you can’t imagine cooked apples without cinnamon, feel free to toss some in. When I first came to America I was overwhelmed by the amount of cinnamon used in so many breads and cakes. It took many years for my taste buds to adjust to apple pie with cinnamon. Irish apple pies or tarts are made without spice or with a hint of cloves. Cut the butter into the flour and rub it in using your fingers or a pastry cutter until the mixture resembles fine bread crumbs. I confess I don’t own a pastry cutter. Throughout my childhood I watched my mom and grannys rubbing butter into flour using their bare hands, so there’s no modernizing me at this stage. You can’t teach an old horse new tricks. 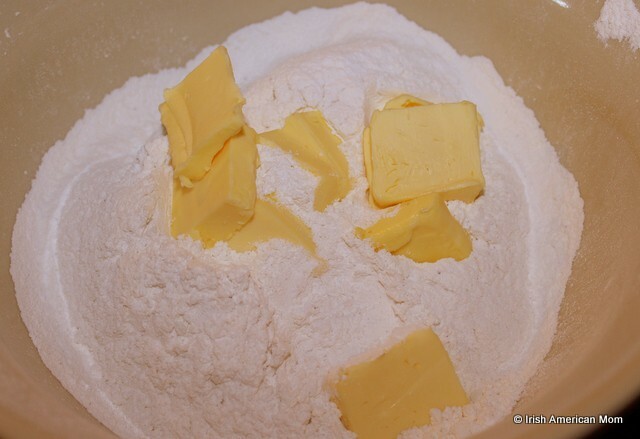 If you use all-purpose flour instead of cake flour, I would increase the amount of butter to 6 ounces. This helps keep the crust from getting too hard. Next toss in the sugar and mix it through the flour. Now it’s time to wash your hands and prepare the apples. Use a minimum of 3 large apples, but in my opinion, it is hard to have too much apple in this cake, so feel free to add an additional one. Peel and slice the apples into similar sized pieces. My apple slices are about 1/4 inch thick. Lie each slice flat and cut them into triangular quarters. The thinner rectangular side slices can be cut in half. 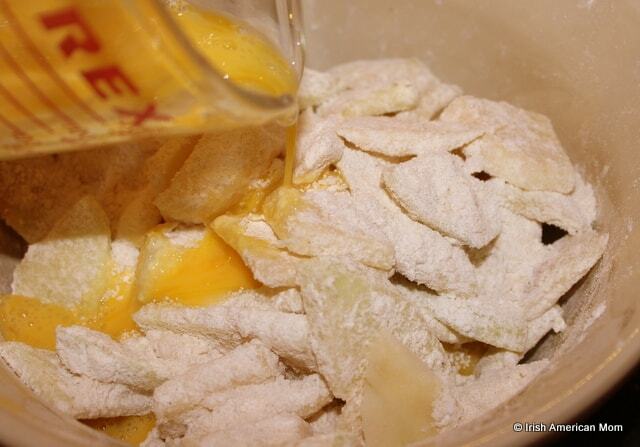 Toss the apples into the flour mixture and combine them thoroughly. My advice is to work quickly because apples turn brown pretty fast. The faster they are covered in flour mixture the better. You can see how my apples are beginning to go a little brown at the edges, but I did have to pause to take photos. Beat the eggs and add a dash of milk. 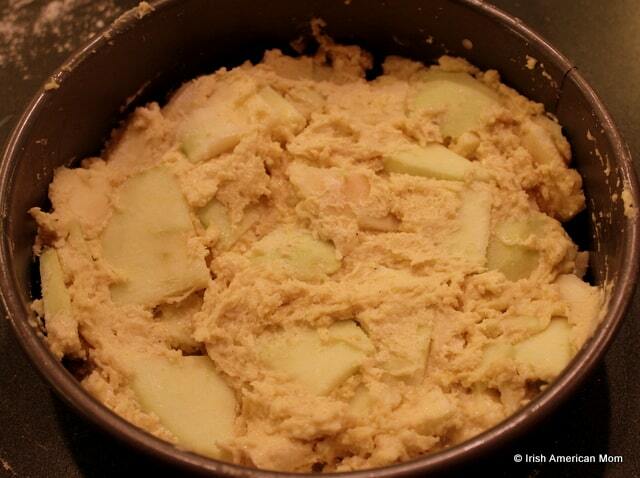 Add to the apples and flour and combine well with a large spoon. Add more milk as needed to fully moisten the flour. The result is a pretty sticky dough. Transfer the dough into the prepared cake pan and flatten the top surface using the back of a large spoon. I use a 9-inch round pan. An 8-inch round pan will simply yield a taller cake. However, moving up to a 10-inch round pan is not advised. With these specific ingredient ratios, the cake would be way too flat. Next comes the final touch for a crispy top layer. Sprinkle two tablespoons of sugar over the top of the cake. In Ireland I recommend using caster sugar, but regular American sugar is just perfect. Regular Irish sugar is far grainier than the American variety. Bake the cake in the preheated 375 degree oven for 45 to 50 minutes. A toothpick or knife will come out clean when it is cooked and the top will be a lovely golden brown. Cool for 5 minutes in the pan, then transfer to a wire wrack to finish cooling. I love to see the slices of apple peeping through the top layer. Just yummy! My family love this cake served still slightly warm. Lovely with butter melting on top, or a dollop of cream or smothered in custard, you’ll certainly be licking your fingers and asking for seconds. Here’s the printable recipe …. Step 1 Preheat the oven to 375 degrees. Prepare a 9-inch round baking pan by spraying with oil or coating with butter. Step 2 Sift the cake flour, baking powder, salt, cloves and nutmeg into a large mixing bowl. Step 3 Cut the butter into the flour and rub it in using your fingers or a pastry cutter until the mixture resembles fine bread crumbs. Step 4 Toss in the sugar and combine it with the flour mixture. 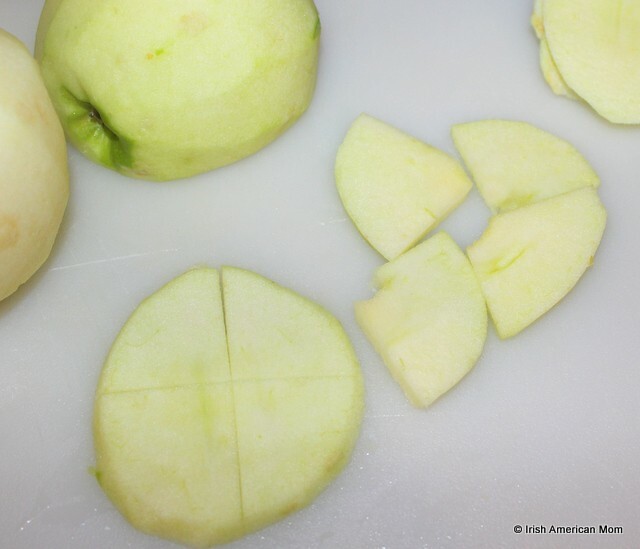 Step 5 Peel and slice the apples into similar 1" to 2" sized pieces. Step 6 Add the apples into the flour mixture and mix them thoroughly. Step 7 Beat the eggs and add a dash of milk. 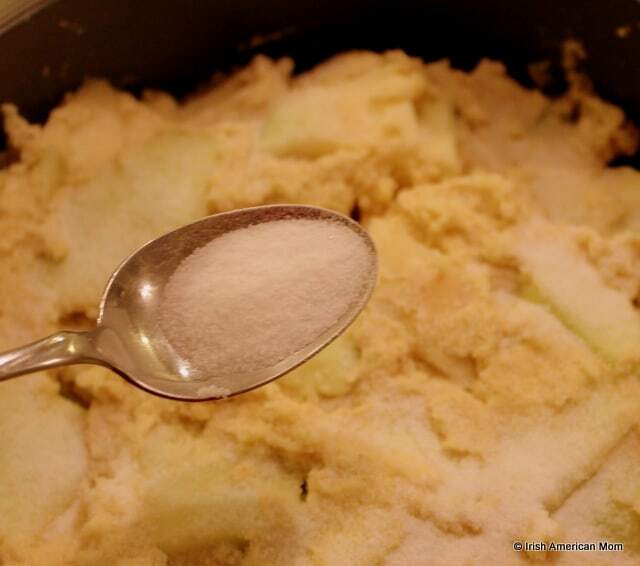 Add to the apples and flour and combine well with a large spoon. 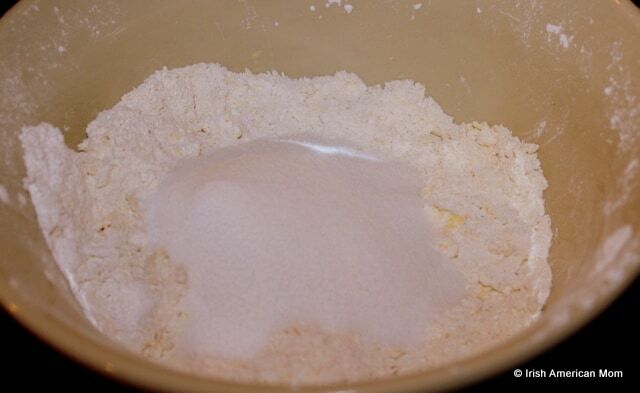 Add more milk as needed to fully moisten the flour. The result is a pretty sticky mixture. Step 8 Transfer the dough into the prepared cake pan and flatten the top surface using the back of a large spoon. Step 9 Sprinkle two tablespoons of sugar over the top of the cake. Step 10 Bake the cake in the preheated 375 degree oven for 45 to 50 minutes. Cool for 5 minutes in the pan, then transfer to a wire wrack to finish cooling. Hope you all enjoy this little taste of rural Ireland.